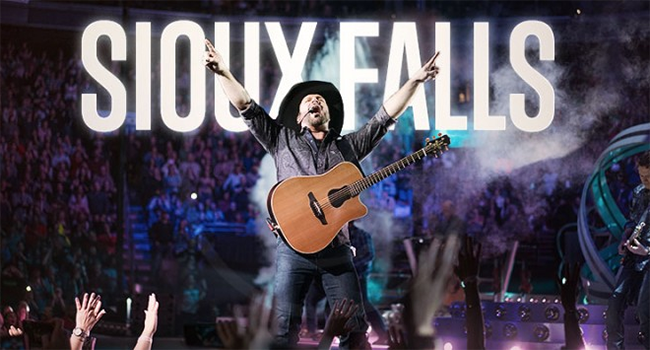 In just 29 minutes, Garth Brooks has broken his ticket sales record for Sioux Falls, SD. His previous record was set October 29th – November 2nd, 1997, with 41,183 tickets sold for Sioux Falls Arena. Today (July 21st), he has sold over 45,000 tickets for Denny Sanford Premier Center and tickets are still selling. There is an eight ticket limit per purchase. Tickets can only be purchased at ticketmaster.com/garthbrooks or either Ticketmaster Express 1-866-448-7849 or 1-800-745-3000. Tickets cost $61.2 plus a $5.51 tax, a $2 facility fee and a $6.25 service charge for a total of $74.98. All seats sold are best available. Brooks is nearing the end of his three year North American tour. As it winds down, shows for Oklahoma City, Los Angeles, Paso Robles, a return to Atlanta — a rare feat during the same tour — and Calgary, AB have been announced. In this week’s Facebook Live Inside Studio G series, Brooks confirmed the tour will take the month of August off to do some retooling before embarking on the eighth and final leg from September through December, with a final stop in Nashville still yet to be revealed.